Professor Tani Barlow presented an overview of her research on Chinese advertising at the turn of the century. 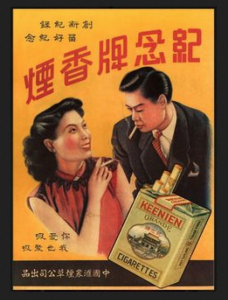 In order to sell foreign-made and mass-produced consumer goods, it was up to the advertising agencies to convince consumers the commodity being advertised was modern and had the power to enhance the consumer’s life. The benefit in this is that ads give historians like Barlow a better idea of what people at that time thought that enhanced life looked like. “Ads are encrypted, so they are little teeny designs that help us to understand how people saw things,” Barlow said. During the years that Barlow’s research spans, China was in political and social upheaval at the same time the Mandarin language was undergoing change through modernization. Barlow referenced the chaotic nature of Chinese life and thought during that period when she noted, “Life changed increasingly rapidly as many of the basic institutions of everyday life collapsed or were destroyed.” Amidst this transiency, the Chinese at the turn of the century were exposed to change in almost every area of life. At that time, the global nature of the emerging modern era was a source of excitement and fascination, and China was no exception. One ad selling chemical fertilizer had almost to do with fertilizer itself. It featured a woman dressed in an internationally fashionable style of coat with cuffs made of fur, probably from Siberia, Barlow said, and a French designer broach. This immediately gives the impression of high fashion, wealth and status and connects it to the fertilizer the ad is trying to sell. This decision came along with the tendency to make products seem “modern” in a variety of ways. Advertisements got less conservative, became more outlandish, and promoted “modern” social conventions, such as the ability of an unrelated man and woman to shake hands – this was promoted and encouraged by a company selling hand care products. Advertisements mentioned things like Mussolini and fascism; most consumers did not know anything about either, but they knew enough to know it was modern. It is this craze for all things modern that Barlow found to be a central focus in Chinese advertising of the period, and that reflects the change in Chinese culture and society during the period. Olivia covers events for the Department of Asian and Near Eastern Languages. She is a senior pursuing a degree in French language with a minor in writing and rhetoric.